Setting the Table with VOGUE x T.T. 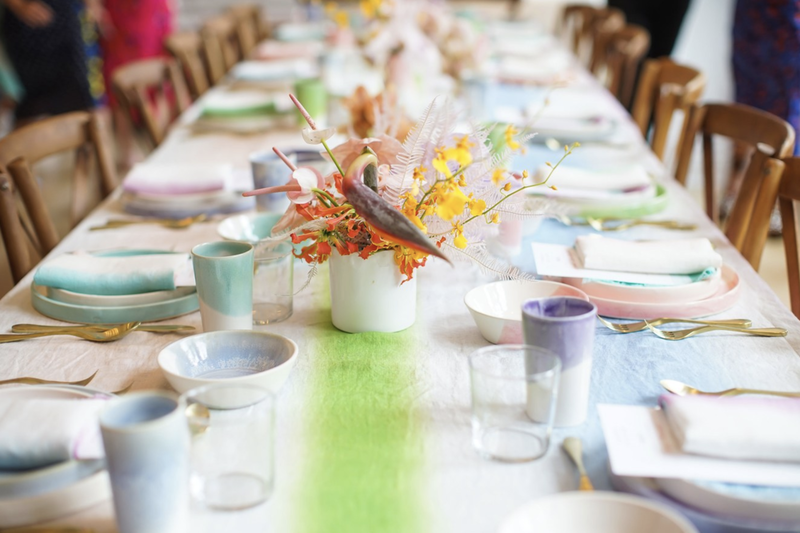 Celebrating Tanya Taylor’s custom collection of ceramics created with the collection’s palette inspired colors. Taylor’s achievement was a fashion-forward and inclusive approach to design attended by equally powerful women including Giovanna Battaglia Engelbert, Saks Fifth Avenue’s Roopal Patel, Glamour’s Samantha Barry and Karen Kaiser. Hosted at Tanya Taylor’s beautiful home in Soho, New York, the room was filled with vibrant colors and figures. The ceramics for the celebration were handmade in Brooklyn to cater to Tanya’s exquisite taste. The event was featured exclusively in Vogue and the sentiment of empowering successfully diverse women wove an inclusive thread throughout the event as a forum for beautiful and talented women to unite and grow. Setting the Table in Paris with L.O.N.B.